We can look forward to a fascinating battle between Microsoft and Google as the pace of growth of Chrome suggests that it will become a real rival to Internet Explorer globally,” commented Aodhan Cullen, CEO, StatCounter. 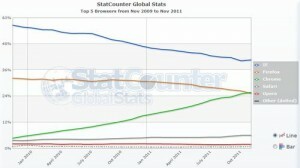 My opinion considering the below image (taken from the same site), is that the battle in the long run is between Mozilla and Google. Firefox is so underestimated and Internet Explorer has a lot of use from old computers, old people, and people with not good knowledge of the internet.